I’ve said it before, and I’ll say it again: if you are an ambitious chess player, no matter your age or rating, you should be using ChessBase. ChessBase, created by the company of the same name, is a chess database manager and GUI used by nearly all the best players in the world. It allows users to access millions of games played across history and the globe, to make use of chess engines while studying those games, and to curate one’s own data with great ease. 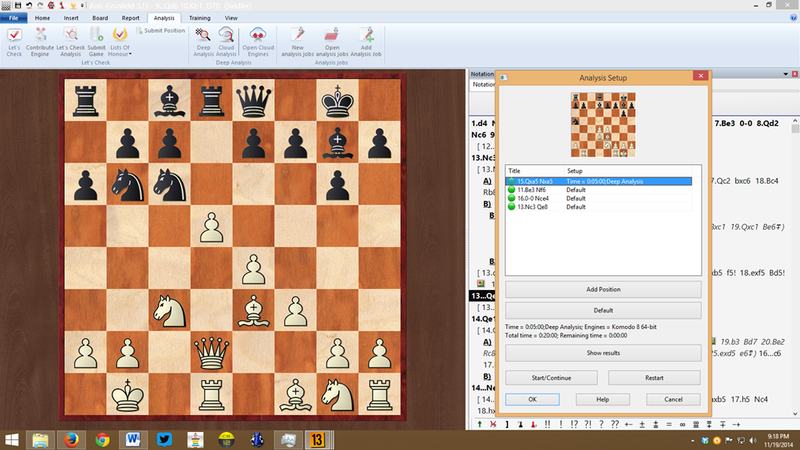 Opening books and endgame tablebases are available to assist with analysis, and links to the Playchess server and the Engine Cloud are built into the interface. After ChessBase 10 was released in 2008, I was under the impression that most all necessary features were baked into the product, leaving little room for improvement and little need to upgrade. ChessBase 11, released in 2010, did little to change my mind. The shift to a GUI based on the Office ribbon wasn’t a game changer for me, and while I thought access to online game databases from within the GUI was nice, I didn’t see it as worth the money required to upgrade. This changed with ChessBase 12. Released in 2012 – note the two year dev cycle? – ChessBase 12 introduced a slew of neat bells and whistles that made me take notice. The ‘deep analysis’ function, perhaps meant to rival Aquarium’s IDea feature, was handy (if still a work in progress). The ability to search for similar endgames and pawn structures was very useful, as was the expanded access to the online database. Direct publishing of games to the viewchess website was a real time saver. But what really impressed me about ChessBase 12 was the initial movement towards the cloud. “Let’s Check,” which first appeared (if memory serves) in the Fritz 13 GUI, is something like a gigantic, decentralized database of analyzed positions. If you are connected to the “Let’s Check” server while you work, ChessBase 12 uploads your engine evaluations of positions studied to the cloud, and it gives you access to the evaluations of others. This can be very useful if, say, you are looking at games from important tournaments. In some cases you are able to ask the server to ‘annotate’ games played that same day, leaving you with suggestions and evaluations from users around the globe. Even more interesting was the launch of the “Engine Cloud.” In simple terms, the “Engine Cloud” allows for remote access of analytical engines anywhere in the world. Those with powerful hardware can, in essence, rent time on their computers to other people, granting them access to their analytical engines for a small fee. (You can also configure your own hardware to be privately available to only you.) Those of us without ‘big iron’ at home can, for very reasonable prices, have blazing fast engines at our beck and call; you might even, if you investigate usernames, get to use a former World Champion’s hardware in the process. Brilliant, brilliant stuff. Now – two years later – ChessBase has released version 13 of their flagship program. It is true, as we were promised in Jon Edwards’ eminently useful guide to ChessBase 12, that most of the features in 12 reappear in 13. What you know from 12 is still true for 13, so there is no real learning curve to be navigated. 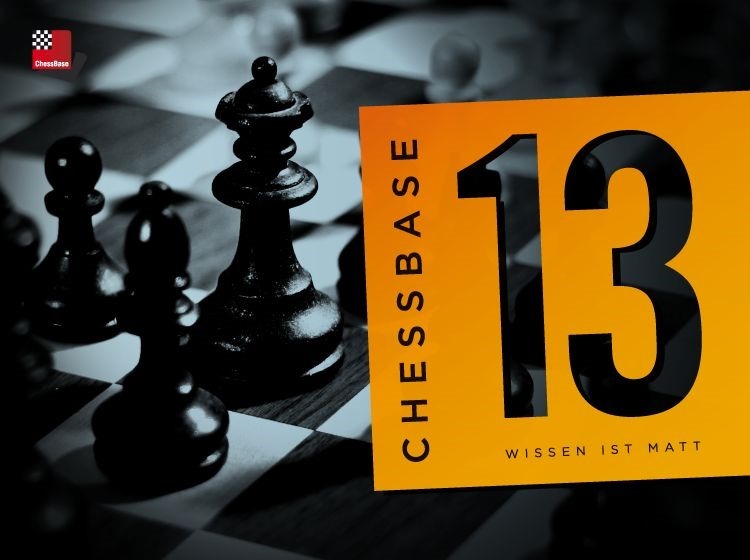 So what is new in ChessBase 13? ChessBase has gotten into the cloud data storage business with ChessBase 13. You can now save data to the ChessBase Cloud, where it will (eventually) be available to credentialed users in the ChessBase GUI, in mobile apps, and in a web interface. Let’s dive a bit more deeply into this, and what it might mean for users. Right now I keep some of my data in a Dropbox folder. This includes my opening analysis, which gets updated fairly often, a database of my games (OTB, ICC, etc. ), a folder of data related to endings and a folder of games from local events. When I write a new game to my games database, it is immediately mirrored to the cloud, and that change is written to my other computers the next time they boot up. The ChessBase Cloud duplicates this functionality, so that databases in the Cloud are mirrored to other computers linked to the same login, but it might also create some additional possibilities. Databases can be shared between users. You can make a database public on the web, or you can specify that only certain users can access the data. This might make joint preparation or joint analysis a real possibility – ‘the Hammer’ (Jon Ludwig Hammer) could update opening analysis overnight and save it to the cloud, where ‘the Dane’ (Peter Heine Nielsen) and ‘the Champ’ (Magnus Carlsen) would find it in the morning. There is also something in the documentation about data being eventually accessible via a web GUI. I could make a file available to a friend who is travelling or who does not have a Windows computer, and they could study it in their browsers or on an app. It’s not fully implemented yet, but if and when it is, this could be a very useful addition to the ChessBase ecosystem. With the new “analysis jobs” feature, you can now specify a list of positions to be subjected to automated analysis without your intervention. This is not the same thing as the automatic game analysis in the Fritz GUI; instead, this seems to be an iterative improvement on the ‘deep analysis’ feature introduced in CB12. The positions can be analyzed two ways: either you get n-lines of branchless variations, or you can use the ‘deep analysis’ feature. In both cases you can specify the engines to be used, the time allotted per position or per batch of positions, and how you want the results of the analysis to be recorded. Let’s say that you’ve been studying the Grunfeld, and you want to check a few positions that came up in Peter Svidler’s masterful video series over at chess24.com. You can put those positions into ChessBase, add them to the list of positions to be analyzed, and then walk away while your engines do their magic. I can see how this might be useful for me at my level, and I can only imagine how it could be useful for a professional with dozens of positions to check before a big event. It should be noted that, as of RC #5 (or version 1 of the official release), I could not coax this feature into full operation. While both the ‘variations’ and ‘deep analysis’ settings lead to analysis on the screen, only the ‘variations’ option correctly writes to the .cbone file that would hold the finished analytical product. I am told, through e-mails with ChessBase, that this should be fixed in the immediate future. Update 11/24: The above bug was fixed in Service Pack #2, out today. The repertoire function is said to be improved in ChessBase 13, so that now White and Black repertoires are distinguished from one another. I have never used the repertoire functions before, not having really seen the need, so I can’t comment on how much of a difference this makes from previous versions. For the sake of this piece, however, I thought I’d give it a try. I created, using around 1400 of my games from the Internet Chess Club, my own opening repertoire files by clicking on ‘Report’ -> ‘Generate Repertoire’ in the database window and following the prompts. 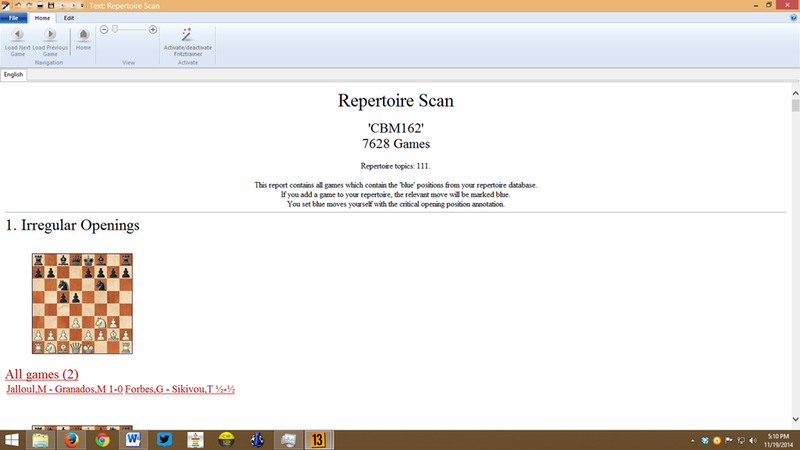 This presented me with two repertoire databases, one for my games with White and one for my games with Black. ChessBase put all of my games with each color into the appropriate game files, giving each game an easily recognizable English-language name and saving the databases to the Cloud. I’d always wondered where one would proceed from here. Certainly it’s interesting to see my games rendered in an orderly fashion, to see what I’ve played at key junctures in my openings, etc., but I never understood what could be done with these repertoire databases after that. One thing you can do is to scan new databases – issues of The Week in Chess, Informants, or CBMs – to see what new games appear in lines that you play. I tested this with ChessBase Magazine 162 and my black repertoire. ChessBase produced a report listing all the relevant games from CBM 162 for my repertoire. I could, for example, add the game Kelires-Lee (Tromso ol, 2014) to my repertoire database, or I could mark a specific move as a key position in my repertoire. Having used ChessBase for many years, and having built up some fairly heavy analytical files in that time, I doubt that I’ll switch management of my repertoire over to the Repertoire Function. Still, I can see why some might, and it’s interesting to see my openings ‘dissected,’ their innards on full ChessBase display! 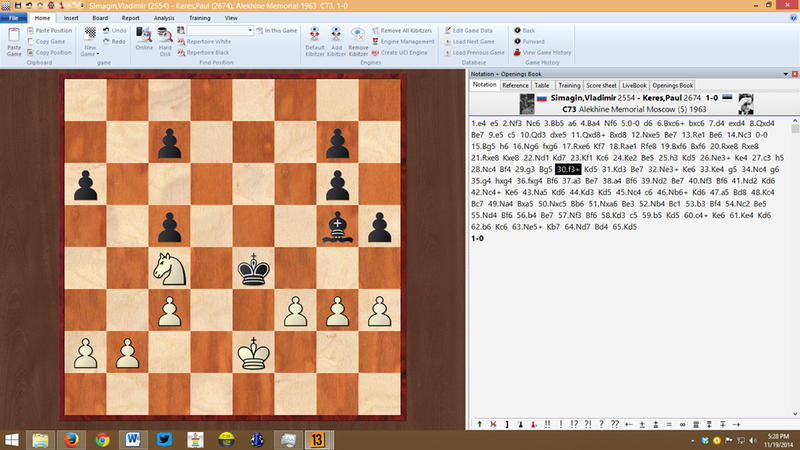 The look of ChessBase 13 is basically that of ChessBase 12, but there are a few tweaks of note. ChessBase can now offer ‘extended information’ in the game window, which means that pictures, flags and rating information for players appears next to names in the game window. There is also a small toolbar at the bottom of the game window containing a palette of Informant symbols. This might make it easier to annotate games, although I’ve always just right-clicked and chosen the required symbol from the menu items. It is also easier to create variations in a game, as the variation dialog appears less often during input. 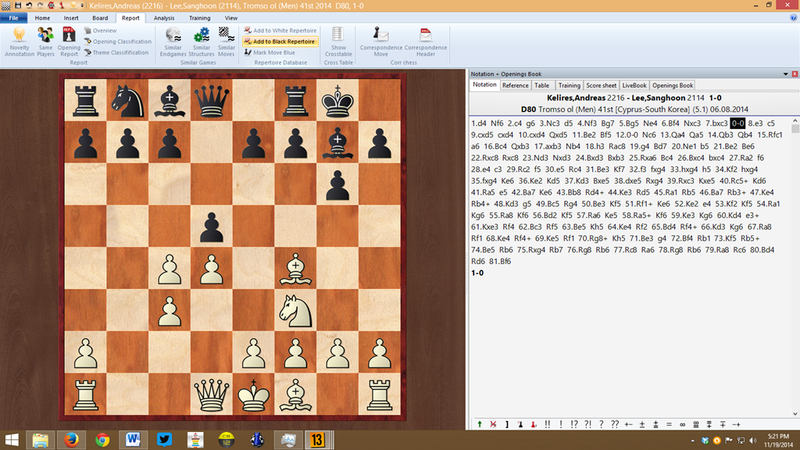 ChessBase 13 allows you to run multiple instances of the program as well as multiple instances of engines within it. This might be useful for the ‘analysis job’ function described above, or if you want to run multiple maintenance tasks at once. There are some new classification tabs available, including one that classifies games by final material count. A few recent additions to ChessBase 12 have also migrated to 13, including support for Syzygy tablebases and for creating and saving illegal positions to a database. This last feature is very useful for teaching, especially if one uses the Stappenmethode series of books. Finally (and anecdotally) startup of ChessBase 13 seems much snappier than 12. I have been using beta versions (#2-#5) of ChessBase 13 for perhaps two weeks now, and for most purposes, it has been stable and without problems. Some oddities remain: for example, you can’t use the keyboard shortcut ‘T’ to take back the last move in a game and enter a variation beginning with that same move, and menu items remain grayed out even when they should be available. [Update 11/24: This second quirk was fixed as of Service Pack #2. All menu items are back to normal.] Players used to typing ‘T’ for ‘takeback’ should instead press the Ctrl key while entering a move to create a variation. Database management – finding / killing doubles, checking / fixing integrity, etc. – is an under-appreciated feature in the ChessBase programs. My original thought for this review was to really put these functions to the test by creating a true Frankenstein of a database, filled with doubles / errors, for testing. 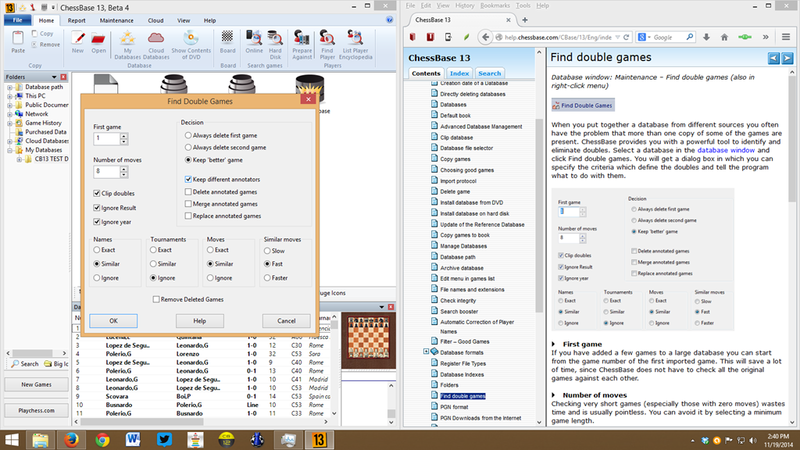 I cobbled together a database of nearly 21 million games from dodgy sources and set ChessBase 13 to finding doubles. This was a bad idea. I killed the effort when, after an hour plus, the program had made it through approximately 19% of the database with a nearly one in three rate of double detection. It would have taken another four or five hours to finish the job! Instead, on the advice of a fellow ChessPub-ian, I asked around amongst some friends and was given access to an Opening Master database (Golem 01.13) containing approximately 8.7 million games. I compared how long it took ChessBase 12 and 13 to find and kill the doubles in that database. CB13 was faster, taking 2 minutes and 21 seconds to complete the job, while CB12 took 3 minutes and 55 seconds. 13 also used about three times the RAM to do the job, which may account for its increased speed. Both detected an identical number of doubles in the database (48,784). Upon finishing the task, the Clipboard opens in both 12 and 13. 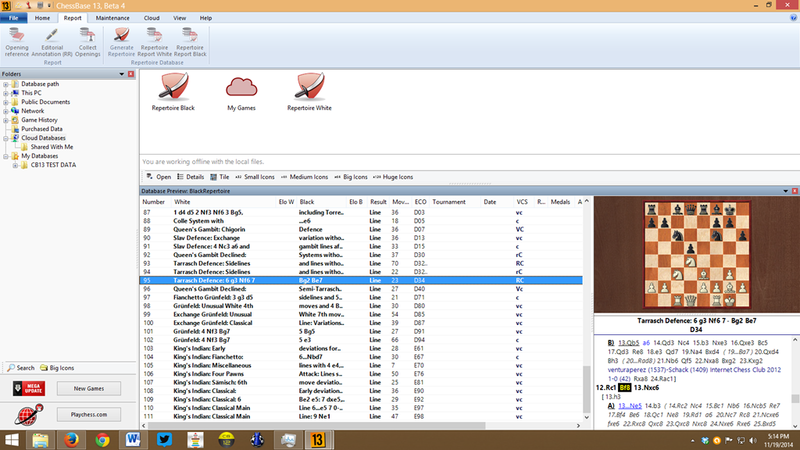 Here, ChessBase 13 froze. This also happened when I stopped the program in the midst of killing Frankenstein’s doubles. In the case of the Frankenstein database, I chalked it up to the enormity of the project, but if the same problem was replicated with the smaller database, there might have been a bug involved. This problem was fixed as of Release Candidate #5. I would have also tested the ‘pack database’ and ‘integrity check’ functions of both ChessBase 12 and 13, but (1) the integrity check is the same in both cases (version 6.04 dated 9.25.13) and (2) the OM Golem database had critical errors that could not be repaired, even with the slow integrity check option. ChessBase 13 represents an iterative improvement over ChessBase 12, but not a paradigm-shifting one. It will become so when the ChessBase Cloud features are fully functional, but for now, I’m not convinced that it’s a mandatory upgrade for ChessBase 12 users. (It’d be nice, though!) Serious analysts, professionals and correspondence players might be the exception here, as the automated position analysis could prove very valuable. Those still using ChessBase 10 / 11 (or, worse, not using ChessBase at all!) should absolutely consider getting a copy of ChessBase 13. The old advertising for ChessBase 3 still holds true: ChessBase is something of a time multiplier, allowing you to do more chess work in much less time. This is truer today than it was then. We have massive, immaculate databases like Big 2015 or Mega 2015 to search for ideas, and we have inordinately strong engines like Houdini, Komodo and Stockfish to assist us. There is a reason that the strongest players in the world use ChessBase: it is indispensable for the modern chess player! Download: the download version is available directly from the ChessBase shop. You only get the program itself; no data is included except for the Player Encyclopedia, and you do not get any extension of membership on Playchess.com. Starter: Includes ChessBase 13, the Big Database 2015 (unannotated) with weekly updates, and three issues of the ChessBase Magazine. No Playchess membership is included. Mega: Includes ChessBase 13, the Mega Database 2015 (68k annotated games) with weekly updates, and six issues of the ChessBase Magazine. No Playchess membership is included. Premium: The Mega package plus the Correspondence Database 2013, the 4 DVD set of Syzygy tablebases (Endgame Turbo 4), and a one-year Premium subscription to Playchess.com. The Starter package runs €179.90 ($190-ish without VAT), the Mega costs €269.90 ($285-ish without VAT), and the Premium package is €369.90 ($390-ish without VAT) when purchased directly from the ChessBase shop. The Download version, available only from the ChessBase shop, is priced at €99.90 ($105-ish without VAT). You can also upgrade from 12 to 13 (program only) for €99.90 ($105-ish without VAT). All these prices will normally be discounted when buying from Amazon sellers. In terms of choosing between these various packages, my only advice is this: the annotated games in the Mega Database are nice to have, but you can do without them if cost is a factor. Beyond that, it’s entirely up to you. This entry was posted in chess engines, chess software, software and tagged Chessbase, ChessBase 13, ChessBase 13 review on November 21, 2014 by fullcityplus.